Apart from being a fascinating city to visit, the other remarkable thing about Dubai is its location. Situated virtually in the centre of the western coastline of the United Arab Emirates, Dubai is never far from the other six emirates. This means you’re only a couple of hours’ driving distance from golden sand dunes, lush oases, the region’s largest camel market, Mesopotamian ruins, some of the world’s best diving sites, bewitching mountains, beautiful fjords, and two of the UAE’s cosmopolitan cities, Sharjah and Abu Dhabi. 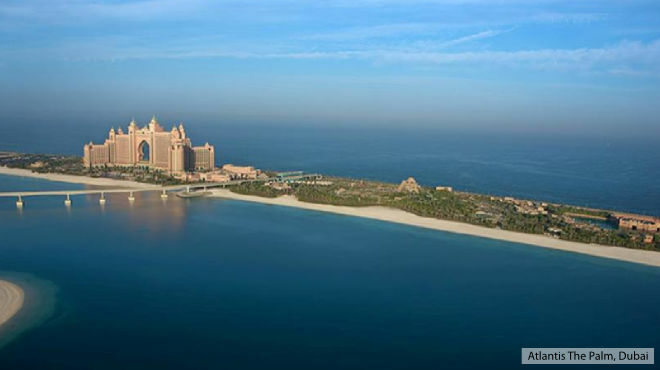 Not many cities in the world can boast easy connectivity to such a broad array of experiences and Dubai is one of them. The roads and highways are in excellent condition, and navigating the region is easy. This means you could rent a car and do these trips on your own but hiring the services of tour companies will make these experiences rich and informative. Tour guides know the best vantage points and can make these excursions seamless. We’ve picked four exciting excursions that you’re guaranteed to enjoy. Musandam : First, the show-stopper, Musandam, easily the crown jewel in your Dubai itinerary. The Musandam peninsula is a 2-hour drive from Dubai, to a jaw-dropping landscape that is technically in neighbouring Oman. This can be done as a day trip but an overnight halt is recommended to truly savour this drop-dead gorgeous destination. Musandam’s purple mountains and beige stone cliffs fringed by turquoise waters are heart-stoppingly beautiful and wow even the most experienced travellers. The landscape is bleak, barren and more beautiful than words can describe. And the upshot is, there is unlikely to be another soul in sight. Believe it or not, there are dramatic fjords to see – yes, in the middle of Arabia! – and mountains located slam-bang in the middle of pristine ocean waters. A must-do is a dhow cruise to Khor As Sham, a rocky fjord that has earned Musandam the title 'Norway of Arabia'. The cruise will also take you to the playground of bottle-nose dolphins or you can simply drift along and drink it all in while exploring the Strait of Hormuz between the Musandam Peninsula and Iran. The main town in Musandam is Khasab, gateway to the ‘Fjords of The Middle East’. The town boasts beautiful, old-style architecture and a 16th century fort that is a must-see. Tip: You cannot get enough of this remote wonderland, so take an overnight halt. Al Ain : When you’ve had enough of the desert, an oasis experience is a perfect way to hit ‘pause’. In ancient times, the desert oasis town of Al Ain was a caravan stop located on fertile plains with an abundant water table. Technically located in Abu Dhabi, Al Ain boasts parks, gardens, farms and archaeological sites dating back 5,000 years to the Mesopotamian era. A tour to this fascinating city will first stop at the Al Ain Museum and neighbouring fortress. At the Hili Graves nearby, you will see a Mesopotamian burial site with its typical beehive tombs. Not far from here, you will be introduced to the ancient ‘falaj’ irrigation system before you proceed to the Al Ain Palace Museum, the former residence of Sheikh Zayed Bin Sultan Al Nahayan, the first President of the UAE. Al Ain also has the highest concentration of Emirati nationals in any Gulf city and this makes it unique from the metropolitan cities in the Gulf region such as Dubai, Abu Dhabi and Sharjah. Perhaps the highlight of your trip to Al Ain is a stop at the camel market, the largest and last of its kind in the UAE. Finally, this exciting tour ends with a drive to the peak of Jebel Hafeet (Mount Hafeet), a craggy limestone mountain which is the second-highest in the region. Abu Dhabi : Abu Dhabi is just 130 km from Dubai. You can drive down in just 90 minutes, tour the main sights and return to Dubai by late evening. A private tour of Abu Dhabi will take you to visit the spectacular Sheikh Zayed Mosque, a modern wonder and icon of the neighbouring emirate. The mosque, which can accommodate 40,0000 people and is built from marble stone, gold, semi-precious stones, crystals and ceramics, took ten years to build and is named after the late president of the United Arab Emirates. This grand mosque, the largest mosque in the UAE and eighth-largest mosque in the world, is the first stop on every Abu Dhabi itinerary. Private tour operators will then take you to a heritage village, which showcases life as it was before the discovery of oil in the Gulf region. This reconstruction of a traditional oasis village offers a glimpse into pre-modern culture, complete with tents made of goat’s hair and mud brick houses. Next, the tour takes visitors to Ferrari World, a mega indoor theme park where roller-coaster rises and Grand Prix-like races promise to end your tour on a high note. Sharjah & Ajman : Both these emirates are located along the Persian Gulf, north of Dubai, and can be covered in a single day trip from Dubai. Sharjah, with land on both the Persian Gulf and the Gulf of Oman, is strategically placed in the region. Known as the ‘cultural capital of the UAE’, this emirate has the traditional and the modern happily coexisting, where souks and large shopping malls rub shoulders as do museums and trendy restaurants and cafés. The reason you want to visit Ajman, the smallest of the seven emirates, is its gorgeous 20-mile stretch of powdery white sand along the Persian Gulf. The beautiful Ajman Museum is housed in a fort that was once the residence of the emir of Sharjah and is worth visiting.